CCG BENEFITS IS unique in the health benefits consulting world as it offers its clients an unrivalled two component service structure that enables full accountability. When the health insurance plan is designed and delivered, someone has to be responsible for the implementation and ongoing administration of the plan. CCG Benefits has proven that unless Health Care Plan Implementation and Administration Services are under the immediate control of the consulting firm, the client is left with split accountabilities. The CCG Benefits two component structure ensures that CCG is always fully accountable for the performance of its recommended health insurance plan. In the ever-evolving benefits marketplace, it is imperative that your Third-Party Administrator has the industry expertise, talented professionals and strategic vision to meet all of your complex and changing needs. CCG Benefits has these strengths. They have propelled us to recognized leadership as a Third-Party Administrator. With our unwavering commitment to excellence in all we do, you are assured of achieving optimal results tailored to your individual needs. Successful third-party administrative services require the ability to stay abreast of industry trends and identify new opportunities. CCG Benefits researches the market and presents, evaluates and supports new products, services and technology. Our ability to anticipate and respond to participants’ requirements has made us the health care service provider of choice for clients. Our success as a Third-Party Health Plan Administrator lies in our ability to offer personalized customer service that answers all questions and offers participants the opportunity to access their claims information and history online. CCG Benefits stands out by empowering participants, by supplying all the information they need to achieve their goals, by implementing advanced technology and by attracting and retaining outstanding customer service representatives. Our talented professional team is knowledgeable, staying current with all employee benefit issues and developments. Each staff member is totally committed to assisting participants with their concerns, such as claim status, deductibles and individual benefits. The blend of talent and technology at CCG Benefits provides the fastest access to vital information by utilizing the most sophisticated Voice Response Unit (VRU), which shows the caller’s history and claim notes on the computer monitor instantaneously, eliminating time-consuming research. CCG Benefits also provides On-Staff ERISA Specialists. Their unique talent enables them to focus more on one area only: the Employee Retirement Income Security Act. Our Client Managers provide you with additional resources to answer difficult questions to which your clients need answers. Our client management expertise makes CCG Benefits stand way above the rest. Our clients have always known that cost containment is a vital aspect of their plan success. CCG Benefits achieves aggressive claims cost management for you. We maximize provider access and discounts utilizing primary, secondary and tertiary networks; develop customized reporting; alert clients to large claim activities; and identify the best of Stop Loss carriers with regard to pricing, policy provisions and claims payment practices. With an eye on cost, we manage claim situations efficiently and expeditiously, obtain prompt reimbursement, and provide actuarial information that can predict future claims risk. We also warehouse claims of medical and prescription drug data. Warehousing facilitates reporting and identifies trends & risks with regard to financial performance of the plan(s). CCG Benefits analyzes claims data, plans design models that encourage good health, and identifies members of the covered population who are at risk for future illness and refers them to support services. CCG Benefits has been a leader in the industry since 1971, and has the means and the methods to assure your plan success. 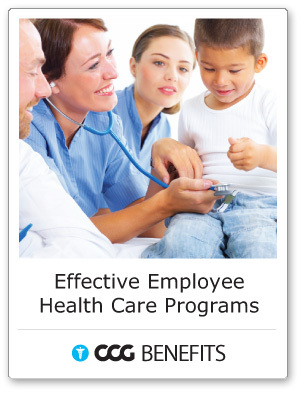 Our unique two component structure—Plan Design and Implementation, coupled with In-House Plan Administration—makes CCG Benefits the choice that will produce the most effective employee health benefit program for your company.